Hi, I’m Mist, I was found in someone’s shed in early June with my brothers and sisters. Our mom was nowhere to be found and we were all alone. Some nice people brought us home to take care of us and get us ready for our forever homes. Now we are healthy, up to date on our shots, altered, and micro chipped. We love to snuggle and play. 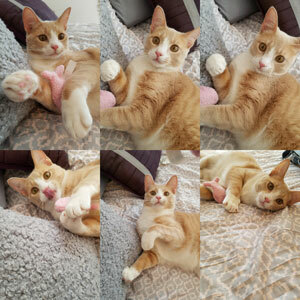 I’ve got lots of energy and love toys. I am ready for a family of my own! Hi, I’m Peanut, I was found in someone’s shed in early June with my brothers and sisters. Our mom was nowhere to be found and we were all alone. Some nice people brought us home to take care of us and get us ready for our forever homes. Now we are healthy, up to date on our shots, altered, and micro chipped. We love to snuggle and play. I’m very affectionate and love to be held. I am ready for a family of my own! Hi, my name is Stripes! My brother Brownie and I are looking for our forever family. We’d like to stay together if possible. We play really well together and are better than most television programs. I’m the quiet one but still have plenty of energy. I love toys and food. I’m really good with the litter box. I love to snuggle especially at night. I love to sleep with my foster Mom. I give her baths just in case she missed any spots. I’m a big boy and have a really shiny soft coat. I’ve been fixed, chipped and had my shots. I’m not sure what that means but it seems to be a good thing. Bobby He is about 1 year old and very energetic! Bobby loves to play and believes there is a game to everything he does. He is good with other cats, fearless of dogs, and enjoys people including children. Bobby came to us as an almost hairless 4 month old kitten who was the size of an 8 week old. He was covered in ring worm and had a bad upper respiratory infection. After a couple of months of TLC, Bobby has turned into a gorgeous boy. Bobby’s only downfall is that he is a beautiful black cat. If he were almost any other color, people would flock to him because of his winning personality. He is looking for a home with someone who can appreciate his beauty and his comical antics. Apply to adopt at https://www.arfn.org/adoption-application/. Once this funny guy is in your home, you will never know what you did without him. Mia is a 1 year young, super friendly girl. She is other dog/cat friendly.